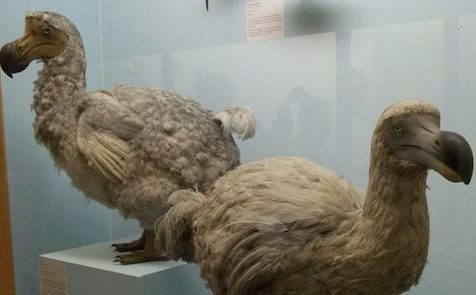 Reconstructions of the extinct dodo in London’s Natural History Museum. The planet could be undergoing a huge wave of extinction, in what three scientists call “biological annihilation.” They calculate that nearly half of all known vertebrate species are in decline, that many mammals have lost more than 30 percent of their geographic range, and that more than 40 percent have experienced severe population declines. In the last 100 years, at the most conservative estimate 200 vertebrate species are known to have become extinct. This is an average of two species a year. Extinction is a fact of biological evolution. There have been five previous episodes of catastrophic extinction in the planet’s history, and even in the long, quiet intervals, each geological epoch has been marked by steady rates of extinction. “Few realize, however, that if subjected to the estimated ‘background’ or ‘normal’ extinction rates prevailing in the last 2 million years, the 200 vertebrate species would have taken not a century, but up to 10,000 years to disappear,” the scientists write in the Proceedings of the National Academy of Sciences. And they say: “Our data indicate that beyond global species extinctions Earth is experiencing a huge episode of population declines and extirpations, which will have negative cascading consequences on ecosystem functioning and services vital to sustaining civilization. This great extinction is, implicitly, linked to the growth of human population and the invasion of what was once wilderness. Although biologists have repeatedly warned that climate change driven by global warming that is in turn fueled by prodigal combustion of fossil fuels brings with it a threat of widespread species extinction, this would represent an extension of already existing hazard. As forests are being cleared, and savannah and grasslands converted for cattle ranches, rivers being dammed and seas polluted, the millions of plants, insects, fish, reptiles, amphibians, birds and mammals face greater competition for food and ever smaller geographic ranges. But human health, wealth and survival ultimately depend on the creatures of the wilderness: forests and forest species deliver the planet’s oxygen, and conserve and recycle the planet’s fresh water, as well as provide the resources from which almost all the world’s medicines, all the world’s food, and many of the fabrics from which the world’s shelter and clothing is made are derived. Since then, biologists, ecologists, oceanographers and even climate scientists have kept up the pressure, warning of damage to whole ecosystems, direct threats to tree species and an accelerated rate of local extinctions. The latest study by Professor Ehrlich and his colleagues is based on a fresh look at an increasingly familiar problem. They mapped the ranges of 27,600 birds, amphibians, mammals and reptiles – that is, about half of all known terrestrial vertebrate species – and analyzed population losses in a sample of 177 well-studied mammal species between 1990 and 2015. “This is the case of a biological annihilation occurring globally, even if the species these populations belong to are still present somewhere on Earth,” said Rodolfo Dirzo, a biologist at Stanford. This article was originally published by U.K.-based Climate News Network, which is run by four volunteers. All are veteran journalists who have covered climate change for many years for leading British newspapers and broadcasters and are now freelancing.